Sculptural form in which figures are carved in a flat surface and project only slightly from the background rather than standing freely. Depending on the degree of projection, reliefs may also be classified as high or medium relief. 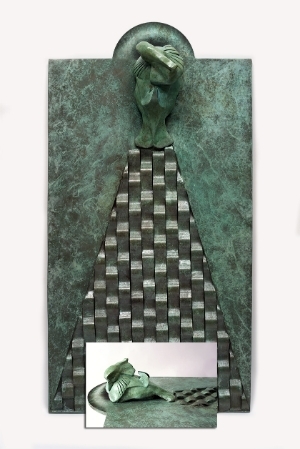 In Mandarin Wall Hanging I have taken this idea to create a sculpture which can be hung on a wall. 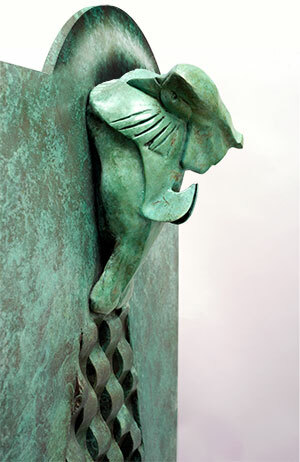 The Mandarin sculpture which preceeded this piece is cast in bronze. By casting the relief in resin I was able to create a bas relief which is suitable for hanging on an interior wall. Mandarin Wall Hanging is currently on exhibit at The Leigh Yawkey Woodson Art Museum in their Birds in Art exhibition and at the National Museum of Wildlife Art, Western Visions. Combine the passionate vision of a rancher’s daughter with a city’s desire to increase revenues, then add in a few pistols and wild rags. What do you get? The makings of a National Cowgirl Museum and Hall of Fame. The National Cowgirl Museum and Hall of Fame had its beginning in 1975 in the Texas Panhandle community of Hereford, TX, about forty miles southwest of Amarillo. Realizing that women of the American West had been largely overlooked for their accomplishments, this visionary group in Hereford, set history straight. Housed in the basement of the Deaf Smith County Library, its first collections were modest: a few belt buckles, bandannas and some Western artwork. But by the time they were moved to a private home in 1982, artifacts had blossomed into vintage photos, rare books, saddles, costumes and more. 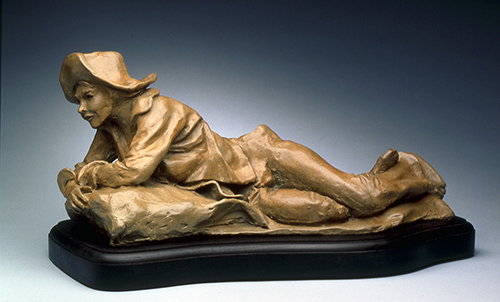 The Museum’s purpose wasn’t just to preserve cowgirl history. It was to share it – every dusty piece of a dream, every unsung feat, every broken barrier. Hereford residents and visitors soon came to know the colorful stories behind these Western women who lived from the mid-1800s to present day — the pioneers, the artists and writers, the tribal leaders, the entertainers, the social activists, the modern ranchers, the rodeo cowgirls. But the rest of the world deserved to know their stories, too. In 1993, the board led by Executive Director Margaret Formby began a search for a new site to broaden their Museum’s educational reach. When Fort Worth leaders got wind they were scouting for a new home, they immediately threw their hat in the ring. Their city’s rich western heritage would be a perfect setting for this authentic Western jewel. Thirty-five cities in six states were considered for the Museum’s new home. Fort Worth got the nod. On June 9, 2002, a glimmer of an idea conceived 27 years earlier became reality. Nested in the heart of Fort Worth’s Cultural District, the National Cowgirl Museum and Hall of Fame took its place among other museum giants: the Kimbell Art Museum, the Modern Art Museum, the Amon Carter Museum, the Museum of Science and History, and the Will Rogers Memorial Center. From a small library basement to a vibrant new 33,000-square-foot facility, The National Cowgirl Museum and Hall of Fame threw open its doors, poised to show all how Women Shape the West…and Change the World. The National Cowgirl Museum and Hall of Fame honors and celebrates women, past and present, whose lives exemplify the courage, resilience, and independence that helped shape the American West, and fosters an appreciation of the ideals and spirit of self-reliance they inspire. I will donate a portion of the sales of “Cowgirl” or any of my other sculptures to The National Cowgirl Museum and Hall of Fame or a charity of your choice. The American Livestock Breeds Conservancy is a nonprofit membership organization working to protect nearly 200 breeds of livestock and poultry from extinction. Included are asses, cattle, goats, horses, sheep, pigs, rabbits, chickens, ducks, geese, and turkeys. I will donate a portion of the sales of this or any of my other sculptures to the American Livestock Breeds Conservancy or a charity of your choice. Founded in 1977, The American Livestock Breeds Conservancy protects genetic diversity in livestock and poultry species through the conservation and promotion of endangered breeds. These rare breeds are part of our national heritage and represent a unique piece of the earth’s bio-diversity. The loss of these breeds would impoverish agriculture and diminish the human spirit. We have inherited a rich variety of livestock breeds. For the sake of future generations we must work together to safeguard these treasures. The American Livestock Breeds Conservancy’s programs include research on breed population size, distribution and genetic health; research on breed characteristics; gene banks to preserve genetic material from endangered breeds; rescues of threatened populations; education about genetic diversity and the role of livestock in sustainable agriculture; and technical support to a network of breeders, breed associations, and farmers. The need for livestock conservation is urgent. Throughout agricultural history, each generation has taken its turn as steward of the genetic trust. Our generation is now in danger of bankrupting this trust and leaving little for the future. Each day, some breeds move closer to extinction. Each extinction reduces the diversity within the livestock species and the biodiversity of the Earth. I hope you will consider helping this organization as it focuses its efforts on endangered species and genetic diversity to help our nation’s animals and those who look out for them. 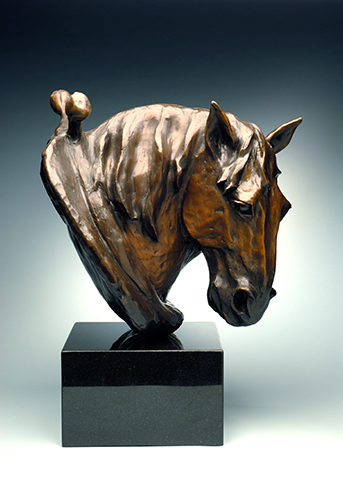 I will donate a portion of the sales of TOM, my horse sculpture or any of my other sculptures to the American Livestock Breeds Conservancy or a charity of your choice. Contact me through my website by clicking here. 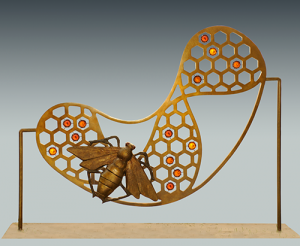 I will donate a portion of the sales of this or any of my other sculptures to the Chesapeake Bay Foundation or a charity of your choice. The mission of the Chesapeake Bay Foundation is to Save the Bay™, and keep it saved, as defined by reaching a 70 on CBF’s Health Index. CBF’s vision: the Chesapeake Bay and its tributary rivers, broadly recognized as a national treasure, will be highly productive and in good health as measured by established water quality standards. The result will be clear water, free of impacts from toxic contaminants, and with healthy oxygen levels. Natural filters on both the land and in the water will provide resilience to the entire Chesapeake Bay system and serve as valuable habitat for both terrestrial and aquatic life. All programs are designed to support state standards of education and are based from the official definition for a “meaningful watershed education experience” as defined by the Chesapeake Bay Program. Programs are supported and created in collaboration with the National Oceanic and Atmospheric Association and the National Geographic Society. “MANDARIN” wall hanging has been chosen for inclusions in the 2013 Birds in Art Exhibition at the Leigh Yawkey Woodson Museum in Wausau, WI. I will donate a portion of the sales of this or any of my other sculptures to the Wood Duck Society or a charity of your choice. The mission of the Wood Duck Society is to educate and promote sound management of wood duck populations and associated habitats required for their reproduction and survival. It all started in April, 1984, when several friends met around the Hawkins’ breakfast table in Lino Lakes MN, to share experiences concerning their box-nesting wood ducks. This April ritual was repeated the next four years, but by 1989, the group had grown too large for the breakfast table and moved to a meeting room at Carlos Avery Wildlife Management Area. Soon the group decided the time had come to share their information through a newsletter called the Wood Duck Newsgram. By 1992, the membership had increased to 150 and an editorial committee was formed. The Newsgram took on a new format and the number of issues per year increased to three. The name Wood Duck Society was adopted by members present at the 1994 annual meeting. The Society now has over 600 members. The Society is currently operated by unpaid volunteers through a Board of Directors. Annual membership dues of $10 cover publication of the Newsgram and other expenses associated with dissemination of information as well as special project activities. Experts in wood duck research and management, graduates engaged in wood duck studies, Society members, and other wood duck enthusiasts are invited to submit articles for the Newsgram and to share their ideas and experiences at the annual meetings. As a Society, they are concerned about the welfare of the wood duck through its range from coast to coast and from Canada to Mexico. Wood duck habits and habitats and how these birds are perceived by people vary considerably within this extensive range. The Society hopes to combine information and knowledge to help educate all parties concerned. The Wood Duck Society, with years of experience and professionals expertise, shares with you, the time proven method for safe and successful wood duck nest box installation and placement. Their method is not only beneficial for the hen and her clutch, but for you with ‘no ladders’ involved. If you are interested in receiving the colorful and ad-free Newsgram, follow this link and click on Membership. Your membership to the WoodDuck Society includes a one year subscription to the Newsgram (three issues, March, July, November). Become a member today! As a member of Artists for Conservation I am proud to be part of a group bringing awareness to the conservation of wildlife and habitats which are threatened. I am anxious to help you in your particular conservation interests and have created this space where we can spotlight each other’s particular interest. 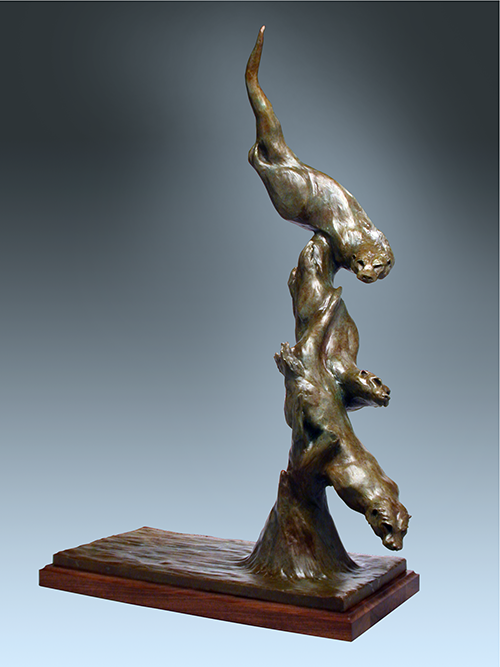 I will donate a portion of any of my sculpture sales to an organization of your choice. Together we can make a difference.